Help CHASA (Children’s Hemiplegia and Stroke Association) tell the world that Kids Have Strokes by obtaining a proclamation or declaration in your city, county or state. Ask your public official to declare that May is Pediatric Stroke Awareness Month. Below you’ll find links to sample proclamations, letters to public officials, and a link to help you locate your public official. Proclamations do not renew, so we must request that a proclamation be issued each year. First, FILL OUT THIS FORM. We’d like to know who is requesting proclamations and where you’re requesting them so we can fill in the gaps if a state is missed. 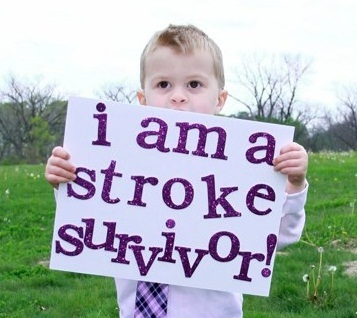 We’d love to see every state proclaim May as Pediatric Stroke Awareness Month. FIND YOUR GOVERNOR’S WEBSITE. Next, go to your state’s site and/or your governor’s site and search those sites for the method of submitting proclamation requests. You might search for proclamations, submit a proclamation, proclamation request, declarations, etc. If you can’t find a way to submit online, then call the governor’s office and tell them you’d like to ask the governor to declare May as Pediatric Stroke Awareness Month. Ask them how you can do this. Don’t let the call intimidate you – you’ll just be talking to someone on the governor’s staff. Once you know how to submit the request, you may find the sample letters and proclamations below helpful. Just fill in the blanks with information on your city. If you decide to add to the letters, keep them fairly short. This will help the staff get started with the proclamation process. The documents below require Microsoft Word. If you do not have this program, and you are unable to open the documents in Works, you can probably open the documents in Notepad. If you continue to have difficulty opening a file, let us know. You’ve Submitted Everything – Now What? You can also ask your city or county to proclaim Pediatric Stroke Awareness Month. You can wait to receive the proclamation in the mail. If you have the time, you can call or email to see if your request was received and if they need additional information. Always remember to thank everyone and be very gracious. Some officials simply do not give out very many proclamations, so if you encounter this, do not be alarmed or feel offended. Keep your cool and just let us know and we’ll find out more about this. If you want to take it a step further, you can try to connect with your local television, newspaper, and community news sources and ask if they’d like to do a story on you and your child. Maybe they’ll send a photographer out when you have proclamation in hand. Remember to ask them to link to chasa.org so the public can find more information. Tell us! We want to know. Fill out this form. We’re excited to hear from you! Send photos and a link to the online proclamation if available. If you’d like, contact the local news sources and see if they’d like to do a story or add a copy of the proclamation to their print or online site. Ask them in the HemiKids Listserv or the Facebook Groups. Other parents will help you and you’ll possibly inspire others to join us in spreading the word that Kids Have Strokes, Too! You can also Contact CHASA with questions if you don’t find answers in the groups. Thanks for helping us help our little stroke survivors and other children who have hemiplegia! Check out how you can help with Pediatric Stroke Awareness.